We are a partner of the Leave No Trace Centre for Outdoor Ethics. The Centre is an internationally recognised organisation dealing with good practice for anyone who values and enjoys the great outdoors. In Your Element follow Leave No Trace ethics (LNT) as an important part of the special outdoor experiences we offer. Every little bit extra you can do to reduce your impact on the places you value helps! Remember, if you see rubbish or litter while out and about, why not try and take it home yourself? We place great emphasis on the safety and comfort of our clients. We only employ suitably qualified, well-trained staff and use only modern, correctly maintained equipment. However, many of the activities that we offer are hazardous by their nature and participants must accept a certain element of risk during their activity session. Parents and guardians must also recognise a degree of risk to their children. To ensure everybody’s safety as far as possible, we reserve the right to postpone or cancel the activities on offer, as weather or group needs dictate. If we believe that individuals are placing themselves or the group at risk by their actions, we reserve the right to remove the person, or persons concerned from the activity. We are licensed by the UK Government Adventurous Activities Licensing Authority (AALA). This involves an annual inspection of our risk assessments, operating guidelines, safety equipment and safety procedures by an AALA inspector. The environment is at the heart of everything that we do. Without the fantastic natural resources of the Scottish Highlands we would not be in business. We are committed to continuing to improve our environmental performance, minimising our environmental impact and making resource efficiency a core requirement of all our operations. In Your Element will monitor and manage its consumption and use of energy. We will work to reduce the consumption of energy and to reduce our contribution to emissions of gases and other pollutants which are believed to contribute to climate change. We will work to reduce the consumption of water within our buildings. All materials used within its buildings both in daily operations and in construction and other projects. In Your Element will purchase goods and services to minimise adverse environmental effects. In Your Element will use local suppliers where appropriate and will encourage its suppliers to commit to improving environmental performance. We recognise the responsibility staff have in contributing to good environmental management. 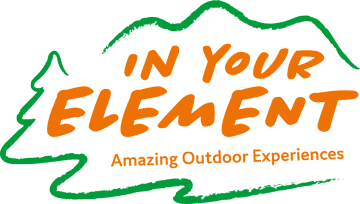 In Your Element will seek to harness and channel the enthusiasm and interest shown by staff and will provide appropriate information and support to ensure that all staff exercise their environmental responsibility. In Your Element will encourage our visitors to cherish our environment so that it can be appreciated by future generations. We will seek to raise awareness amongst our visitors of the impact that tourism can have and what they can do to reduce their impact. Where possible, In Your Element will monitor and manage its consumption and use of other resources and materials, working to minimise our reliance on non-renewable resources and to avoid use of any hazardous substances. Environmental impact is a key criteria for consideration during every site-specific risk assessment that we carry out. Venues that we use regularly will be monitored to ensure that man-induced erosion is not occurring over time. Large scale charity events can be a vital way of raising money for good causes. We will only support such events that are very carefully managed and make use of well built paths and tracks that can cope with high numbers of people over a short period of time. The history and culture of the Highlands is very important to locals and visitors alike. In Your Element will seek to actively promote our cultural heritage and will not participate in activities which threaten to erode that rich heritage. In Your Element aim to make profits, and we make no apologies for this. By operating a private enterprise in a responsible way we bring a lot of benefit to the economy of rural areas and help to ensure that these communities remain viable. Without profits there are no jobs, no payments to suppliers and less personal development opportunities for local people and visitors. It is not just our personal ethics which encourage us to minimise our impact on the environment, it makes sound business sense. We are committed to continually improving our environmental performance, minimising our environmental impact and making resource efficiency a core requirement of all our operations. Energy: In Your Element will monitor and manage its consumption and use of energy. We will work to reduce the consumption of energy and to reduce our contribution to emissions of gases and other pollutants which are believed to contribute to climate change. Water: We will work to reduce the consumption of water within our buildings. …all materials used within its buildings both in daily operations and in construction and other projects. What information do we hold, when do we share it and how long do we keep it? We gather personal information from clients including their name, address, email address, payment details and mobile phone number during the enquiry stage of booking. The client’s name and phone number will be included in our paper Booking Confirmation document is provided to our instructor for the duration of your activity. This will be destroyed following completion of the activity/hire. We have many repeat clients so we will retain your details for next time. If you do not wish us to retain your information please contact us to “be forgotten” and your information will be destroyed immediately . We will hold your personal information in our secure, password controlled electronic systems, which are backed-up daily on remote servers. System access is restricted to relevant members of staff. It is necessary on occasion, to provide access to our IT support partners for the resolution of technical issues. Our Acknowledgment of Risk form requires the names and addresses of all participants, including under 18’s. These forms are stored securely and are destroyed after the retention period stipulated by our insurers. We do not share any client personal information. For employees we hold name, address, date of birth, phone numbers, bank details, emergency contact’s name and address, and National Insurance numbers. We will share employee personal information with HMRC and our Pension Scheme. We will hold this information for as long as legally required. All of our systems used for the processing including storage of client and employee information are online secure systems, which are backed-up regularly by the package providers. All paper-based information is retained within the secure location, with limited access and is destroyed securely when appropriate. You have the right to access the personal information we hold about you. If it is incorrect we will correct it. You can also request for the information to be removed. If you do not wish us to retain your information please contact us to “be forgotten” and your information will be destroyed immediately. Why do we need a PIA? By their very nature, many of the activities that we offer are physically challenging outdoor experiences often taking place in remote locations and can present a certain element of risk. It is for this reason that it will be necessary to obtain personal information regarding individual participants to ensure the safety and comfort of all of our clients. This information can be of a sensitive nature such as food allergies and medical details. It is important that our clients have confidence in how we will collect, process and delete this information. Personal information regarding individuals will be sought from the activity organiser (e.g. teacher) to ensure the safety and comfort of all participants. Name, age, medical details, special needs, food allergies will be requested as appropriate to the activity. This information will be used solely for the planning and execution of the group’s programme of activities to ensure the safety, comfort and enjoyment of our activities by all participants. The information will be provided, usually electronically, at the later planning stages of the programme. The details will be provided to the activity instructor in paper form before the activity programme commences. Upon completion of the group booking, the electronic and paper based information will be permanently deleted. This will impact approx. 1,000 clients per annum. Participants are required to complete a paper AOR prior to commencement of certain activities, this includes the participant’s name, address and age (if under 18 years old). These forms are stored securely for the duration required in order to comply with our insurers policy. These forms will be destroyed following the end of the relevant insurance retention period. We consulted with Ledingham Chalmers as CBP advisers in preparation for GDPR. The Director (Commercial) will undertake the internal consultation requirements on systems or procedure related issues. The Director (Operations) will be the internal consultation for all instructor staff in the first instance. We will consult externally with our legal advisers should the situation occur. The GDPR responsibilities of the organising body e.g. school or youth group should ensure that they only share with us the necessary information on individual participants. A very limited amount of personal information is necessary to ensure that participants’ safety and comfort is maintained during the activity programme. Any non-compliance by our staff will cause us reputational damage and result in a loss of trust in us by our clients. We are very proud of our reputation and strive to maintain the high level of trust and respect our team has built with clients over the years. The following Risk Issues have been identified with the risk to the individual and our safeguards to minimise any form of potential harm to any activity participants. All risk issues are considered to be of an extremely low level to cause any type of harm to participants. Inappropriate activity participation due to receiving inaccurate, incomplete or out of date information. 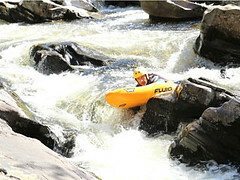 Our instructors are highly qualified and trained in providing outdoor activities to a wide range of ages and abilities. Our instructors will adapt and change their activity plan should an individual be unable to participate fully and safely within our Risk Assessment and Safety Procedures. This may involve ending the activity session. If you’d like to download a copy of our policy please click here.